Turcas signed a joint venture agreement with The Shell Company of Turkey Ltd. (“Shell Turkey”) in 2005 for retail and commercial sales, marketing and distribution of fuel products and lubricants. Shell & Turcas Petrol (STAŞ), in which Turcas has a 30% stake, commenced operation on July 1, 2006 pursuant to this agreement. With a network of 1,011 Shell-branded fuel stations across Turkey and net sales of TL 19.6 billion in 2017, STAŞ is not only a sector leader, but also one of the largest companies in Turkey. As of December 2017, STAŞ is the market leader in gasoline and diesel sales made “under canopy”, with a 20.9% market share. According to 2017 data from the Turkish Petroleum Industry Association (PETDER), STAŞ is the market leader in lubricants sales with 25,5% market share. As of November 2017, STAŞ is the market leader in gasoline and diesel sales made “under canopy” with a 19.5% market share. According to 2017 data from the Turkish Petroleum Industry Association (PETDER), STAŞ is the market leader in lubricants sales with 25.5% market share. The Company ended the year in third place in the auto gas segment with 11.78%market share. Over 550,000 vehicles are registered in the Shell Vehicle Identification System (including Shell Partner Card and euroShell), the first and most comprehensive fuel management system in Turkey. The company runs Turkey’s largest loyalty card program in the fuel retail sector, with nearly 10 million cards and almost 2 million active members. The Shell & Turcas Commercial Fuels team maintains a successful sales performance in the direct and indirect bulk fuel market. Through its dealers, Shell & Turcas cooperates with dominant industries in the indirect fuel market – such as mining, concrete and construction – all of which contribute significantly to the Turkish economy. Independent generators and energy distributors are dominant in the direct fuel market. With the Leading Distributors project, the Company aims to differentiate with value-added services such as quality control vehicles, visits to Shell technology centers, and tank cleaning. Fuel stations are crucial for lubricants exchange services. Lubricants and fuel distribution retail are intertwined business lines. The company’s sales and marketing organization is based on consumer groups and reaches more than 900 direct customers through three distinct sales channels: B2B-Corporate Sales, B2C-Consumer Sales, and reaches nearly 15,000 customers through INS-Distributor Sales channel. The company also makes sales via fuel stations. Lubricant sales primarily consist of automotive industry, industrial, and marine lubricant sales. Key sectors include automotive manufacturers and after-sales service providers; the energy, construction and metalworking industries; other brand and value-focused consumer groups. According to 2017 data from the Turkish Petroleum Industry Association (PETDER), STAŞ has maintained its top position in the lubricants sector. The Company was the market leader in total lubricant sales for the eleventh consecutive year. Among PETDER members, STAŞ recorded the highest volume in lubricants sales in the market: with 88,000 tons sold. STAŞ has become a model of success by demonstrating the same performance in the global market as in Turkey. Shell was named the “No. 1 Global Lubricants Supplier” for the eleventh year in a row in a survey conducted by Kline, an international consulting and research firm. STAŞ’s lubricant and grease oil production plant in Derince currently exports products to 61 countries. Sales are realized first to nearby markets, and then to other Shell countries in the network. With an export volume amounting to more than 28,000 tons in 2017, the Derince plant, a world-class manufacturer of superior quality lubricants and grease oil, posted an all-time record in exports in 2017. STAŞ has received major global awards from Royal Dutch Shell over the years. The “People Make the Difference” program is designed to identify best practices in customer service and service quality among 16,000 branded Shell stations in 65 countries worldwide. Under this program; the company’s Ankara Konutkent Gas Station was named “Europe and South Africa Champion” in 2012 and Kirazlı Gate Bağcılar Station was named “World Champion “ in 2016; Amasya Station earned this designation in 2013; Antalya Kundu Station won the title in 2014; and Düzce-Kapıcı/Zafer Petrol was recognized as the Turkey Champion in 2015. STAŞ owns a total of 8 oil product terminals across Turkey. Of these, three are operated solely by the company and five are operated jointly with partners. The company also has two LPG filling and storage facilities. 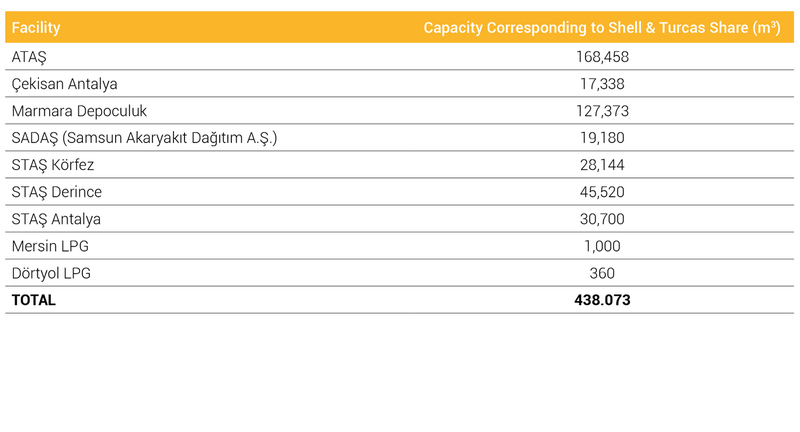 At these terminals, STAŞ’s capacity totals 492,000 m3. In addition, STAŞ operates two LPG filling and storage plants with a capacity of 1,360 m3.